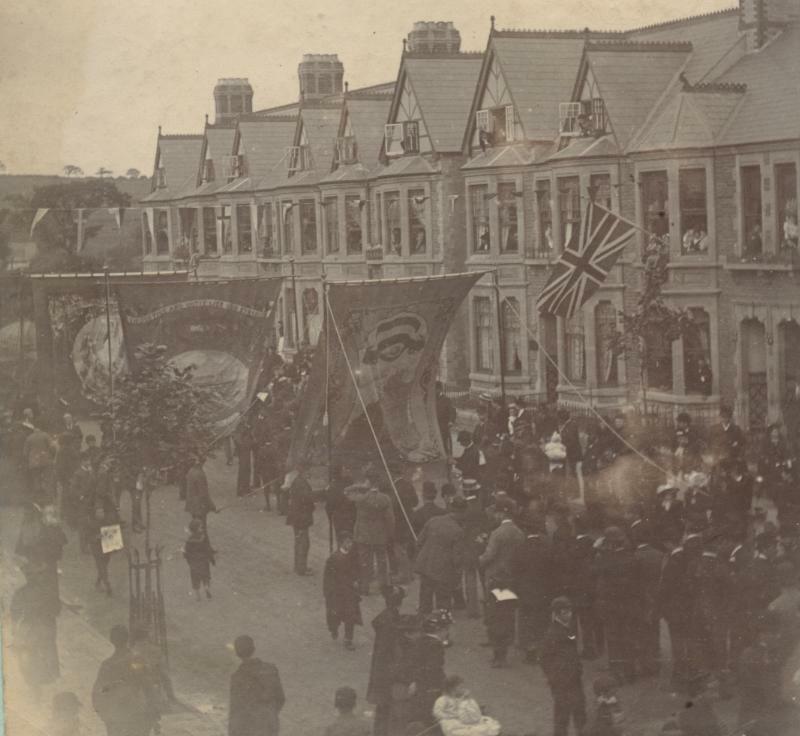 The opening of Roath Park on June 20th 1894 was, in the words of the Western Mail the previous day, “the consummation of seven years’ work”. This was Cardiff’s first publicly-owned park, built on land donated for the purpose by the Marquis of Bute and other landowners. The Marchioness of Bute cut the first turf in a ceremony in August 1887 in what became the Recreation Ground. Construction began in earnest in 1888 and by early 1894 the work was nearing completion. As it still is today, the park was divided into five distinct sections – recreation ground, pleasure garden, botanic garden, lake and wild garden – covering some 120 acres in total. It was fully enclosed by railings and surrounded by newly built roads that provided a spectacular three and a half mile drive around the park. 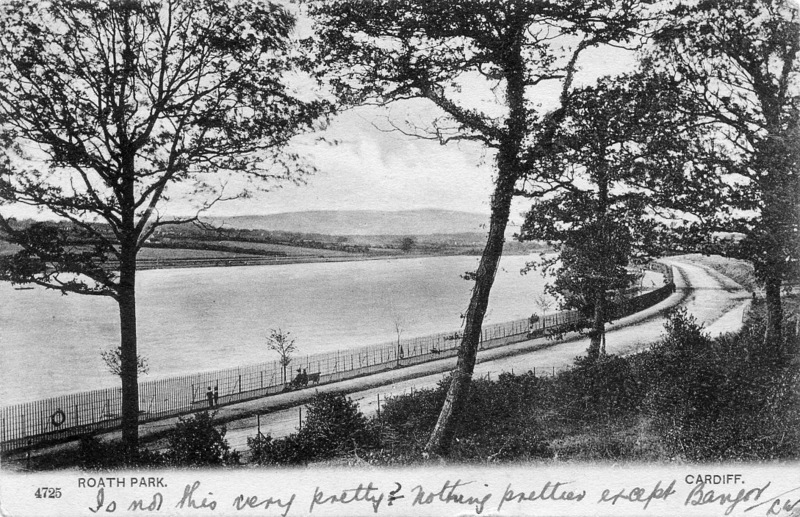 The postcard image below, a Francis Frith photograph taken in 1896, shows the railings and road on the eastern side of the lake. The Parks Committee planned an opening ceremony that would match both the importance of the new park to the town, and the scale of the engineering achievement. 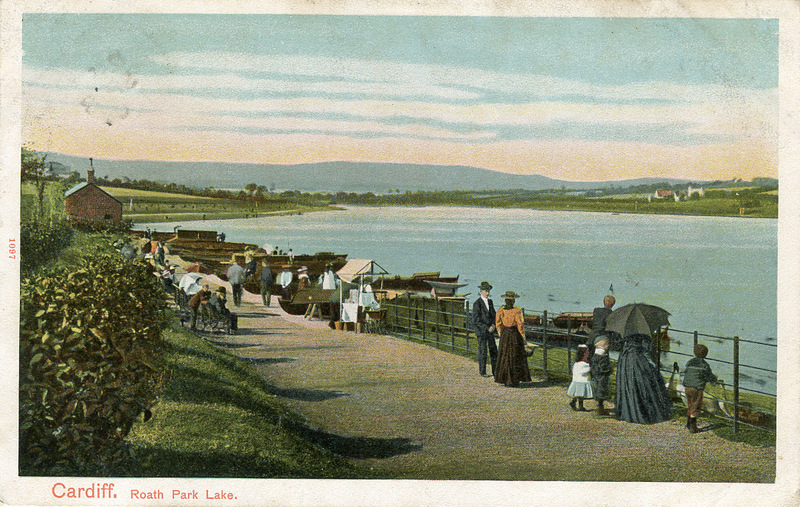 On March 29th it was decided that the park would be called Roath Park and it would be opened by the Earl of Dumfries, the eldest son of the Marquis of Bute, on June 20th, his 13th birthday. At the same meeting it was also agreed that a demonstration of aquatic sports would be held at the lake on the opening day and that memorial trees would be planted to commemorate the occasion. 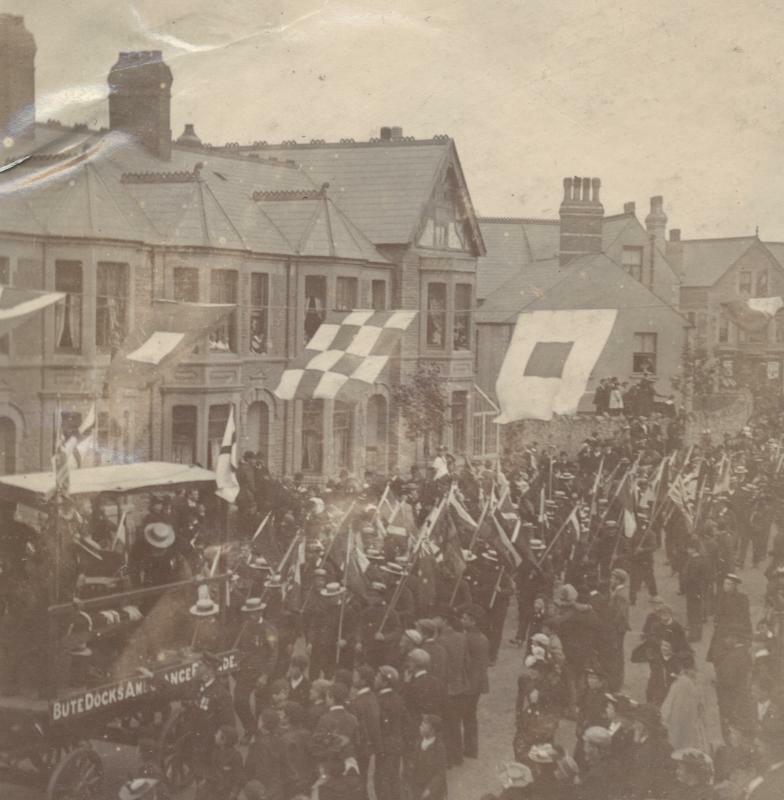 On the opening day itself the Western Mail observed: “A great influx of visitors is expected from all quarters today, the railway and steamboat companies have arranged numerous excursions, and tens of thousands of people will probably foregather at the Roath quarter of Cardiff to witness the consummation of the great work inaugurated just seven years ago.” This expectation was evidently fully justified, as the Western Mail’s report next day stated that “the procession … covered nearly three-fourths of the distance from the starting point to the park, and occupied about three-quarters of an hour in passing a given point.” In the procession were mounted police, fire brigade and various Council officials (including the borough engineer William Harpur and head gardener William Pettigrew, who were largely responsible for designing and laying out the park). 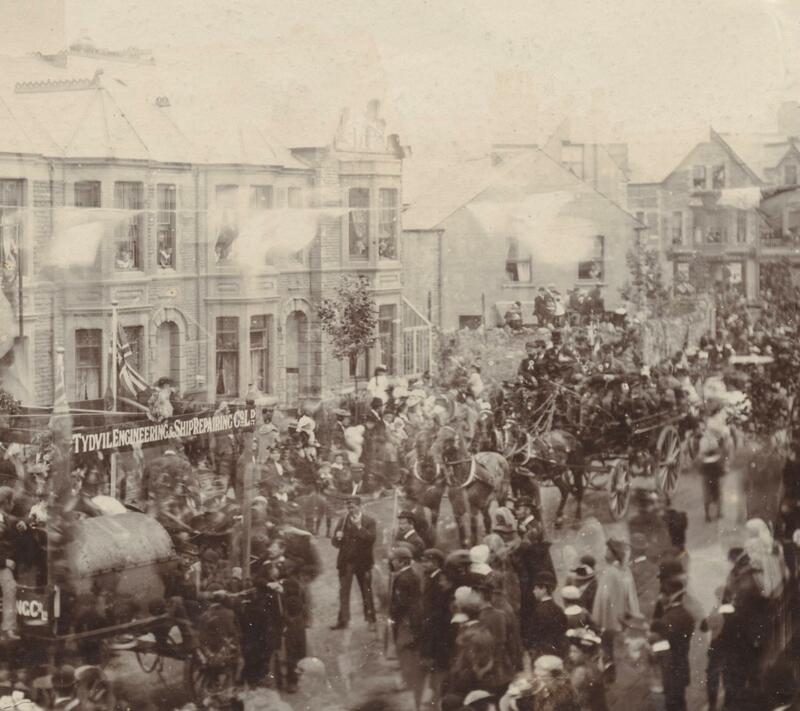 The ceremonial party comprised the Mayor and members of the Council, the Earl of Dumfries and the Marquis of Bute. Trades and friendly societies, accompanied by bands and banners brought up the rear. On arrival at the park the Earl opened the gate with a gold key handed to him by the Mayor, and the ceremonial party entered the park, where there was an enclosure for Council members and other leading citizens to sit, and a raised platform. The public were then admitted and surged in, the police being unable to keep the crowd out of the enclosure. More rockets were fired on the railway and there was enthusiastic cheering from the crowd. When the speeches ended the ceremonial party took a drive round the park, along Ty Draw Road and the eastern side of the lake, round the Wild Gardens and along the western side of the lake. Arrangements had been made for an excursion on the lake, but this was omitted owing to lack of time. The party returned to Cardiff Castle for presentations to the Earl by the Chamber of Commerce and the townspeople, followed by an evening banquet given by Lord Bute, and a firework display at Sophia Gardens. On June 20th the public were admitted to the Recreation Ground and lake section only, but the following day the park was fully open – meaning that there was also access to the Pleasure and Botanic Gardens. The Wild Garden was not completed and opened until 1896, and Llandennis Gardens, at the north end of the park, was laid out in 1897-98 but not opened to the public until 1923 following the extension of the borough boundary. Roath Park immediately established itself as Cardiff’s most popular park, a position it retains 120 years later. Under the headline “The Park a Favourite Rendezvous”, the following appeared in the Western Mail on June 23rd 1894, three days after the official opening: “The Roath Park has fairly jumped into popular favour, and on Thursday the recreation field was the resort of many hundreds of people who strolled to and fro enjoying the fresh air and sunshine, and admiring the picturesque views of the surrounding country. From early morning until dusk, groups of children could be seen enjoying themselves at various games, and at the Lake the boats were freely patronised by a considerable crowd of visitors. 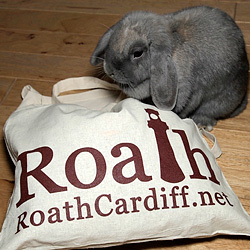 Judging from appearances up to the present, the Roath Park promises to be the favourable resort of the town”. Read more on Anne’s blog and follow her on twitter here. Follow Cardiff Libraries on twitter here.